"Hoodia gordonii P1010383" by Winfried Bruenken (Amrum) - Own work. Licensed under CC BY-SA 2.5 via Wikimedia Commons. Hoodia gordonii is traditionally used by the San people (Bushmen) of the Namib desert as an appetite suppressant as part of their indigenous knowledge about survival in the harsh desert conditions. In a well-known case of biopiracy, bioprospectors from South Africa’s Council for Scientific and Industrial Research (CSIR) realized that the plant was marketable and patented its use as an appetite suppressant without recognizing the Sans' traditional claims to the knowledge of the plant and its uses. The patent was later sold to Unilever, which marketed hoodia products as diet supplements. In 2003, the South African San Council made an agreement with CSIR in which they would receive from 6 to 8% of the revenue from the sale of Ho. gordonii products, money which would be deposited in a fund to purchase land for the San people who had been dispossessed from their lands by white settlers. 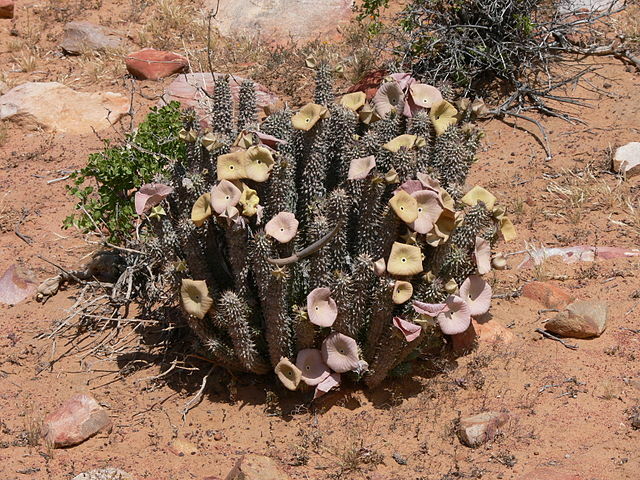 Many Hoodia species are protected plants, typical of the Namib Desert, ranging from central Namibia to southern Angola, especially in plains and rocky areas. Common names include "Bushman's Hat" and "Queen of the Namib". 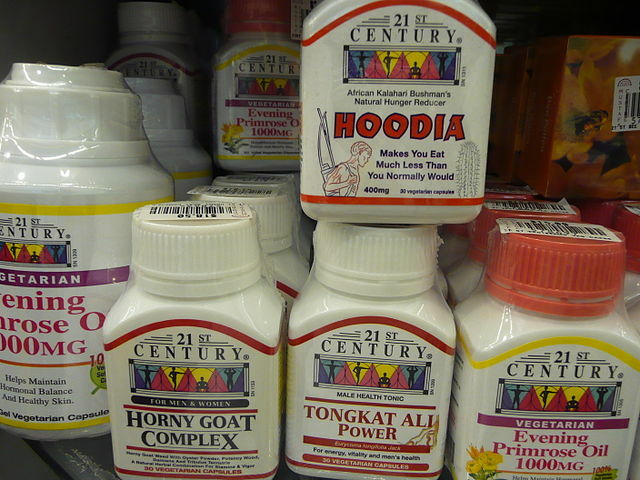 „Hoodia-packaged“ von Seth Mazow - Horny Goat Complex? Hoodia?. Lizenziert unter CC BY-SA 2.0 über Wikimedia Commons. I though hoodia illegal/dangerous. And horny goat complex? Come to think of it, I know some folks back home who could use so of that... Interestingly, all of these were made in the USA. I wonder why you can manufacture and export hoodia but not sell it.